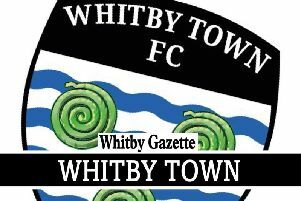 Whitby Fishermen’s Society missed out on a place in the final of the North Riding County FA Saturday Challenge Cup after defeat to West Pier. The Scarborough News Saturday League Division One title favourites proved just too strong for Mark Storr’s men, eventually running out winners by a 4-1 scoreline. The result was an exact repeat of last weekend’s league meeting between the two sides, with Pier dominating the first half and taking a three-goal lead into the interval. WIll Jenkinson moved the hosts ahead with 15 minutes gone, sweeping home after Steve Sheader headed the ball down to him following a corner. Martin Cooper doubled the lead when he kept his cool to round visiting keeper Paul Cull and finish off a fine team move. The same player then took the score to 3-0, 10 minutes before half-time, with an almost identical goal. Billy Logan’s deft chip ended the game as a contest after the break, and although the Fishermen pulled a goal back later on through Mark Swales, it proved too little too late for Storr’s side. Dave Welham was named as the Whitby outfit’s star performer. In Division Three, Rob Winspear’s Sleights Reserves claimed a fine home victory over promotion hopefuls Goal Sports. The hosts took the lead through Ryan Roe after just 30 seconds and the visitors never recovered. Simon Taylor registered Sleights’ second of the afternoon, while at the other end, Goal Sports struggled to create many chances of note. Their best opportunity fell to Niall Prentice early in the second period, but he missed the target with the goal gaping. The villagers worked hard to ensure a clean sheet for keeper Dave Fish after the break, and young man of the match Taylor Humble put the icing on the cake with a third goal in the closing stages.